As you have probably figured out from the title, I have found another challenge…..the GYCO “Get Your Chef On” Challenge!! This month’s ingredient is Shrimp… I’m sure you figured that out from the title as well. 😉 What you don’t know yet, is how crazy delicious this Shrimp Pesto is!! I was so excited when I saw that the ingredient was shrimp, I love shrimp! I cook with shrimp all of the time, and then it hit me. I have already posted all of my favorite shrimp recipes…..oughto! 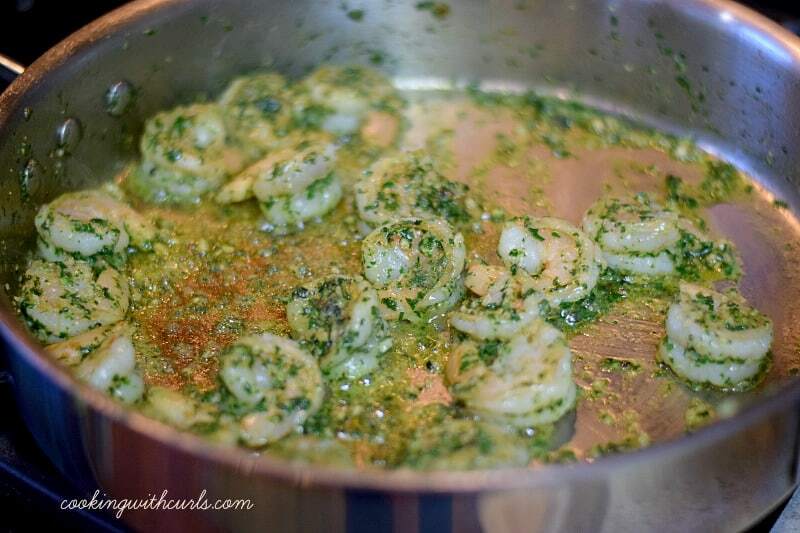 There were two different recipes that I had been working on, and I finally settled on this one…..Shrimp Pesto. I made a dish very similar to this one many, many years ago…like 23 years ago, right after I first got married. That version was loaded with butter, so that was the first thing to go. I wanted to keep it light, and fresh, and it worked. You can serve the shrimp with pasta, or steamed rice. In a lot of ways this dish is very similar to a stir-fry, but has Italian flavors. We start by preparing our basil pesto. You could use jarred pesto if you prefer. They usually add milk to prepared pesto, so I have to make my own. Place the basil, garlic, pine nuts, and Parmesan in the bowl of your food processor…..
Pulse to combine the ingredients, scraping down the sides as necessary. 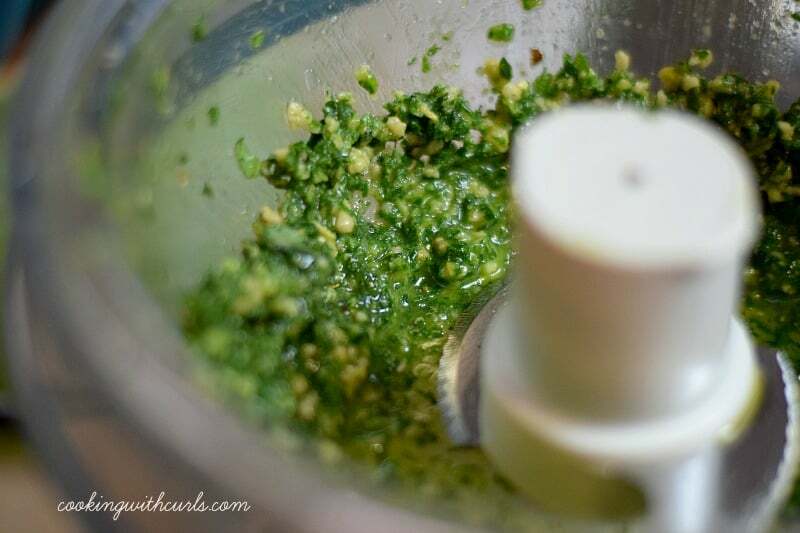 Slowly stream the olive oil into the pesto while it is running…..
Add salt and pepper to taste, and set aside. 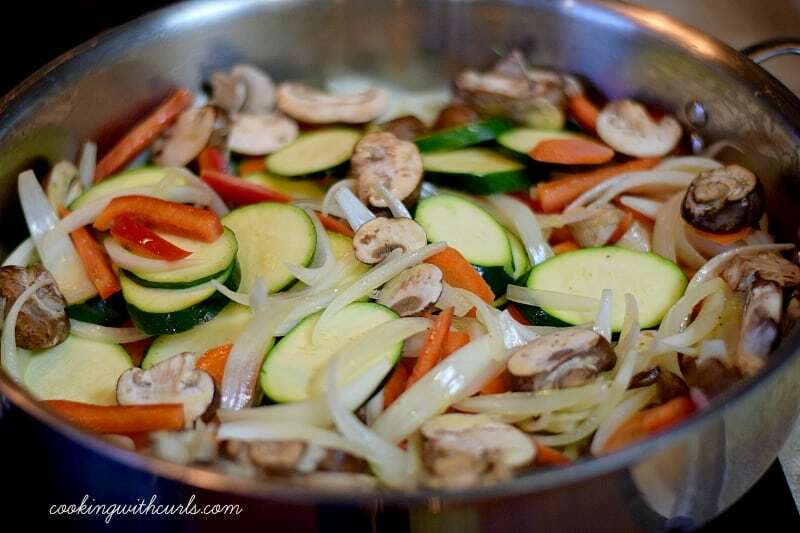 Next we cook our carrots and onions…..
Then add the zucchini, mushrooms, and bell pepper….. 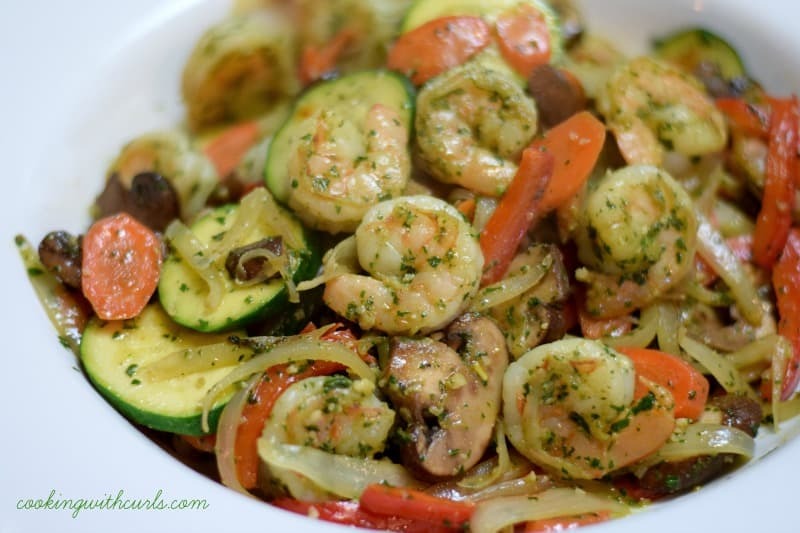 Remove the cooked vegetables, and heat the pesto and cook the shrimp…..
Return the vegetables to the pan and stir to coat with sauce…..
Shrimp Pesto tossed with pasta, veggies and perfectly sauteed shrimp. 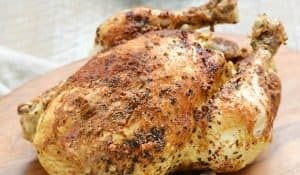 Everyone in the family will love this easy, yet impressive, weeknight dinner! 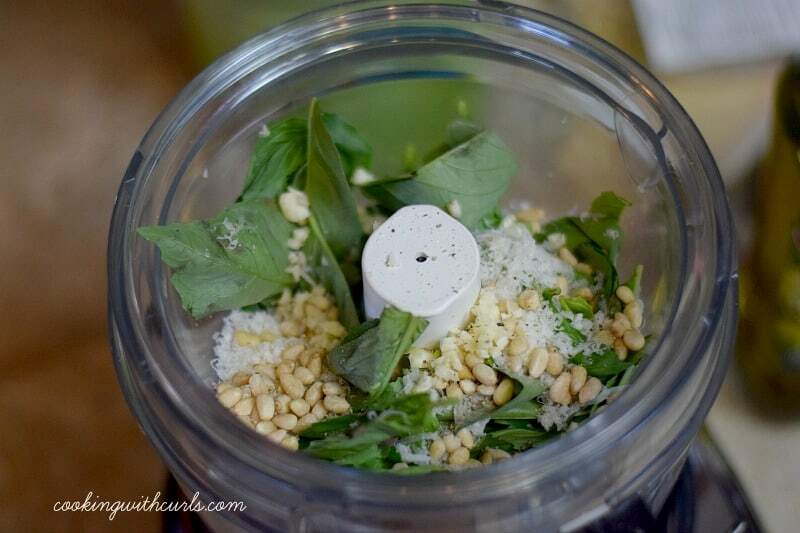 Place basil, Parmesan, pine nuts, and garlic in a food processor. Pulse a few times. Slowly add the olive oil in a constant stream while processing. Stop and scrape down sides as necessary. Add salt and pepper to taste. Set aside. Heat 2 Tablespoons of oil in a large skillet over medium-high heat. Add the carrots and onions and cook for 2 minutes. Add 2 more Tablespoons of oil to the skillet, and add the zucchini, bell pepper, and mushrooms. Cook for an additional 2 minutes, or until the carrots are almost tender. 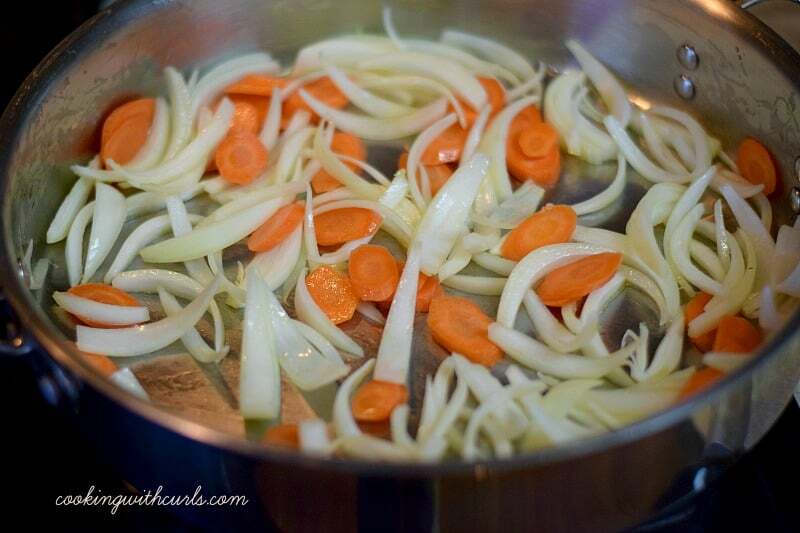 Remove vegetables from the skillet and keep warm. Add 2 Tablespoons oil to skillet, stir in basil pesto sauce. Add the shrimp and cook until they turn pink, 3 - 4 minutes. Return the vegetables to the skillet and stir until covered with sauce. Serve over cooked pasta or steamed rice. That looks so delicious! I wish that my husband liked shrimp! I’ll have to make it some night that he’s out haha! This looks awesome – I love all of the veggies included!!! 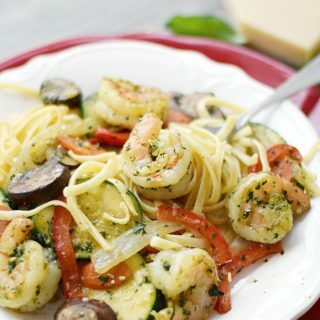 Lisa, I LOVE how you did your shrimp dish with pesto! You’re so creative. I seriously just want to dive right in to this bowl of pasta… no lie… straight in! Lisa, this is my kind of pasta! I love shrimp any way I can get them. Can I tell you once again that your photos are looking so amazing? Beautiful job! What a fabulous dish, Lisa! All those yummy vegetables look so tempting coated with the flavorful sauce. 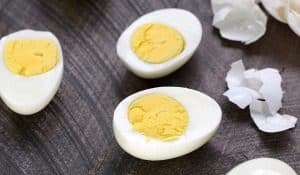 Fresh, fast, and delish! This is gorgeous, Lisa! 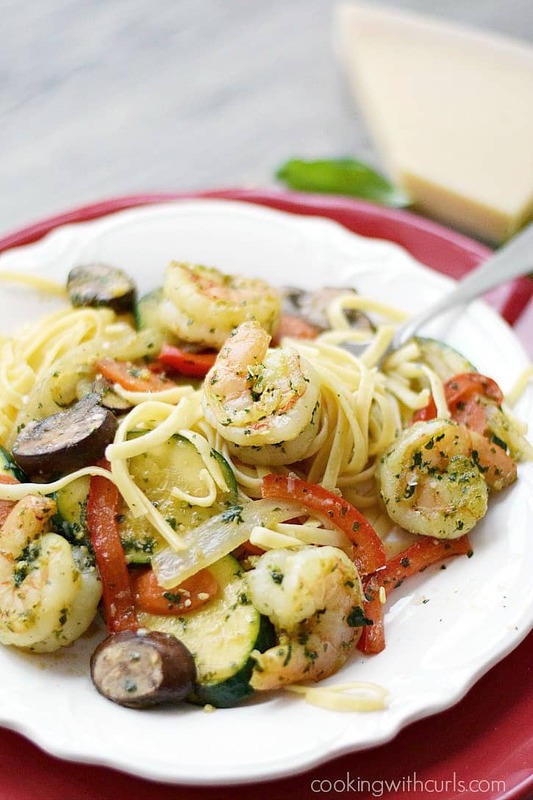 Love pesto, love shrimp, love all the veggies! 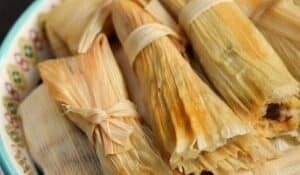 Delicious (and fast!) dinner! 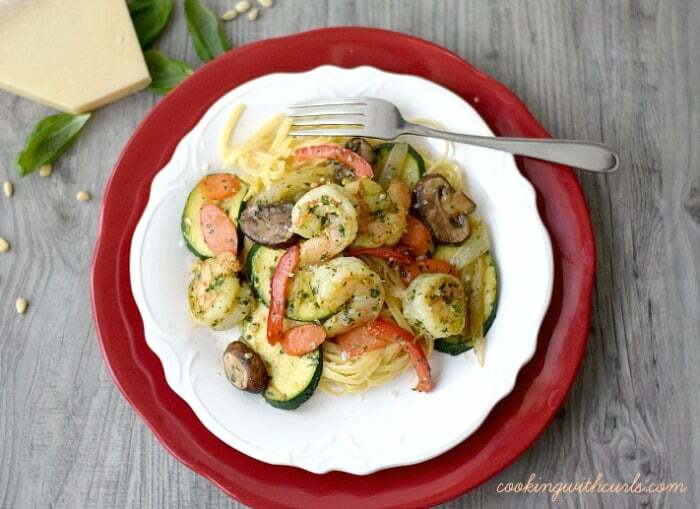 Thanks for linking up with Sweet and Savory – this pesto looks amazing! And I really, really like shrimp 🙂 Yum! Oh my gosh, Lisa! I love dishes like this! This is one of the most viewed posts at Sweet & Savoury Sunday! 🙂 And Pinning! YUM! Those prawns look so succulent! What a great dish. Thanks for linking up to Sweet and Savoury Sundays, stop by and link up again this weekend! This is totally my kind of pasta dish! Anything with pesto is a win in my book! !